Craftsman 31-Inch 2-Drawer Mechanic Tool Cart Only $88.99! Down From $150! You are here: Home / Great Deals / Christmas Deals / Craftsman 31-Inch 2-Drawer Mechanic Tool Cart Only $88.99! Down From $150! Sears has this Craftsman 31-Inch 2-Drawer Mechanic Tool Cart on sale for $99.99 (Reg. $150) + $11.00 back IN Shop Your Way points. making it only $88.99! Plus you can get FREE in-store pickup or FREE shipping! 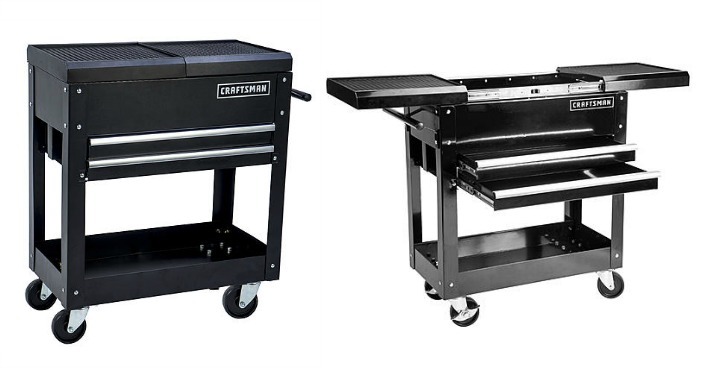 The Craftsman 31 inch Mechanic Cart is a 2 in 1 tool cart for professionals. It is designed to be used as a work surface on the top with the capacity of 350 lbs and storage for your tools. The tool cart was built with all steel construction and features the top compartment, two drawers and one shelf for storage. It gives you the advantage to organize, store and move your tools with the ease. The top compartment opens with the sliding top, which is designed to be used as the work surface when it is closed. The two full sized drawers are great for your common used tools that you need them within your reach. In addition, the lower tool tray gives you the extra storage for shop necessities. Final: $88.99 PLUS FREE in-store pickup or FREE shipping!